A dagger treated with plague. The blade is curved like a talon. A dagger often used by women and children for assassination. Among the various unique weapons, this is one of the especially sinister. 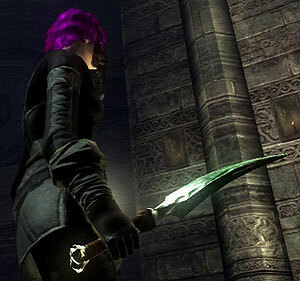 This dagger can be found at the end of 3-1, after or during the boss fight. It's behind the altar at the end of the church and is safer to take during the boss fight than after it. If you choose to take it after the fight, then you need to walk slowly and face the wall, or else the Gargoyles will grab you. You can also obtain it by killing Sage Freke in the Nexus. Thanks to the JP Wiki for the upgrade information.